This may sound like an exotic fantasy, but in fact it's the tale of three attempts to develop advanced Army AA guns in the 1950s; one Swiss (for the British), one British, and one American. The Second World War clearly demonstrated the importance of air power over the battlefield and the havoc which could be wreaked by ground attack planes, whether fighter-bombers like the P-47 and Typhoon, or specialised armoured attack planes such as the Hs 129 and Il-2 Sturmovik. Clearly, it would be important for armies to have their own close-range defence against such threats and much effort was put into developing appropriate systems. Guided AA missiles were still in their infancy in the 1950s so the obvious solution was a fast-firing automatic cannon. The UK (with help from Switzerland) and the USA developed gun systems to prototype stage, all of considerable technical interest, but none proceeded further. The Swiss gun was the 421 RK (known to the British who sponsored its development as the Red King), the British weapon was code-named Red Queen, the American one was the Vigilante. 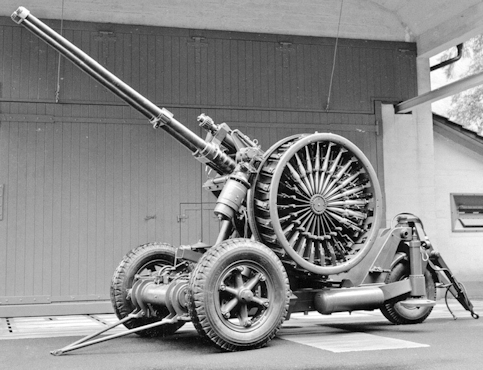 In the late 1940s the British Army decided it wanted to replace its 40mm Bofors L/56 guns with a system with a much better ballistic performance and a higher rate of fire, plus a large magazine capacity. It is unclear whether they issued a specification internationally, or approached Oerlikon, or Oerlikon heard about it and approached them. Whatever, Oerlikon was soon involved. In 1950 a contract was signed between the UK and Oerlikon in Zurich to develop this system, which was given the factory designation 421 RK. The 421 RK (42mm, 1st model Revolver Kanone) shown above was fascinating. The unusual calibre of 42mm was selected, firing a 1.09 kg shell at 1,070 m/s to develop a muzzle energy of 624,000 joules, an increase of 80% over the 40 x 311R Bofors L/56. The gun design chosen was a revolver, but with a seven-chamber cylinder and two barrels. It is not clear whether the barrels fired simultaneously or alternately. 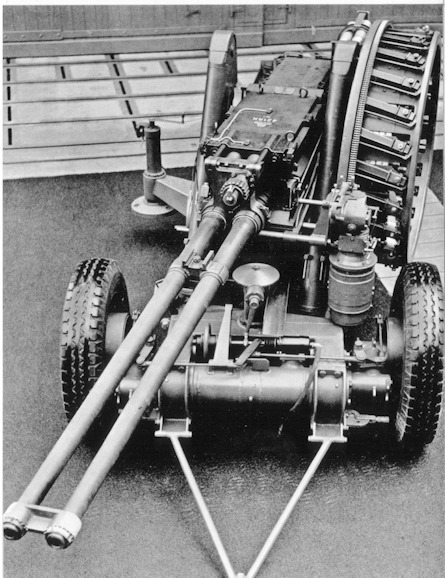 Ammunition feed was by means of a 75-round pan magazine to the left side of the gun (with the rounds pointing inwards) which was reloaded by means of three-round clips, and a rate of fire of 450 rpm was claimed (three times that of the Bofors L/56). The entire weapon on its wheeled mounting weighed over 6 tons (6,500 kg). This project was given the code name "Red King" by the UK, presumably inspired by the RK designation (at that time British military projects were given colour codes at random to ensure that they didn't indicate the purpose of the system, e.g. the Blue Steel airborne nuclear missile). 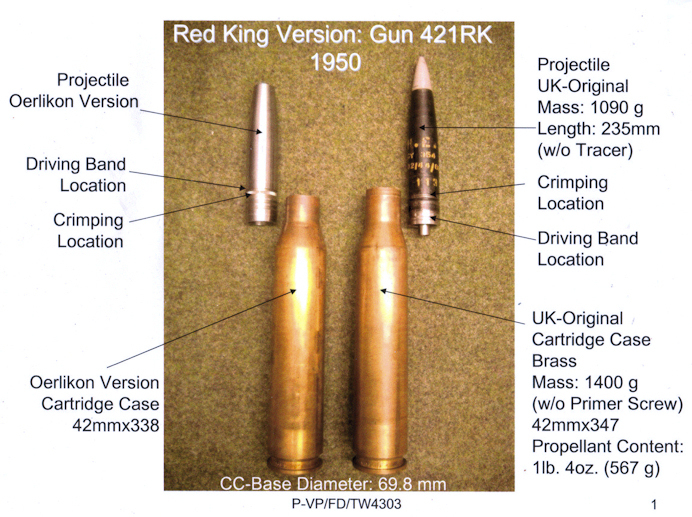 The ammunition developed for the Red King had cases varying in length between 338mm and 348mm depending on whether Swiss or British projectiles were fitted. Rim diameter was 70mm. Oerlikon produced a limited quantity of cases, primers, HE shells and point detonating fuzes, but surviving cases are British-made; the extent to which Oerlikon actually produced their own 42mm ammunition is not clear. 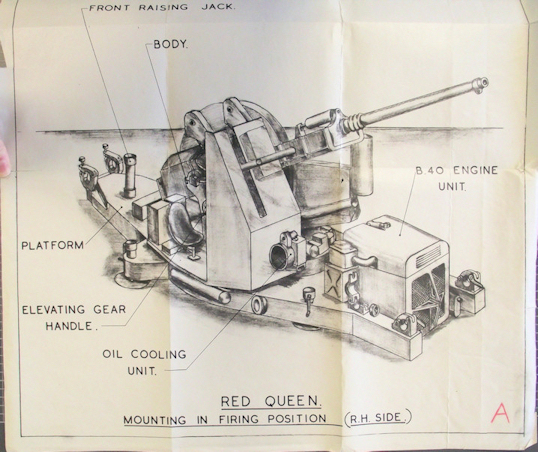 Oerlikon continued working on Red King until 1958. An indication of the fate of the ammunition “left-overs” from the 421 RK development program is recorded in an internal memo dated 18.02.1960. At this time, 168 rounds of British origin were stored at the Oerlikon proving grounds awaiting further instructions. That is the final reference to this project. According to Alec Beanse, the MoD Pattern Room originally contained a Red King and it took up quite a lot of room there; it was removed to an unknown destination some years before Enfield closed. For some reason not yet discovered, in 1952 the UK decided to develop a rival to Red King under the 'Red Queen' designation. The gun which emerged (shown above) differed in various respects from the Oerlikon, most notably in having a single, water-cooled barrel rather than twin barrels, but it retained the huge, side-mounted pan magazine (only just visible in these illustrations). The ammunition was also changed quite significantly; the 42mm calibre was retained but the cartridge case was made shorter and fatter (81mm diameter instead of 70mm). Different case lengths were tried; one version with a 251mm long case is known but a longer 270mm case was selected for development. It is assumed that the ballistics remained the same as the RK 421's, but no firm data survives. The reason for the change in the shape of the cartridge case from the RK 421 is not recorded, but it may have been to reduce the action length and thus speed up its operation. To date, no official documentary evidence has been found concerning any aspects of the 42 x 270 ammunition developed for Red Queen. Of this short cased British round, a small number of TP rounds as well as a proof shot and fired cases have turned up in England. It appears that the weapon experienced significant development problems. 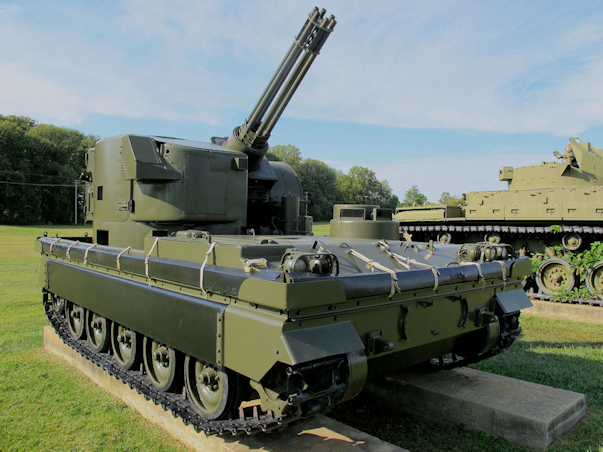 Once Bofors had introduced the much-improved 40mm L/70 in the early 1950s, Red Queen was cancelled and the Bofors was adopted by the British Army for close-range air defence until it was replaced by the Rapier missile system in 1979. Neither Red King nor Red Queen seems to have lived long enough for the testing and series production of combat ammunition. The US Army also wanted a 40mm Bofors replacement and towards the end of the 1950s a new gun and cartridge were developed to meet this need. They chose a calibre which they had traditionally used, 37mm, but a new 37 x 219SR T68 cartridge was developed, featuring a shell with a long, tapered ballistic cap or windshield. The cartridge case is based on the 40 mm Bofors case, shortened, necked and with the rim turned down. Early Vigilante cases even retained the 40mm Bofors' clip groove in the base. The mouth, neck and shoulder of the case were the same as the 37mm M16 and 37mm M17 cases for the U.S. anti tank and anti aircraft weapons, respectively, except the neck was shortened so the cartridge could have a similar overall length while employing a projectile with the rotating band farther to the rear. Standing next to each other, the Vigilante ammo and the anti-tank round have similar overall length, and nearly identical placement of the shoulder and the same shoulder angle, the only real difference is the shorter neck and wider base of the vigilante round. Muzzle velocity of the T68m was 915 m/s, but the shell weight is not given. 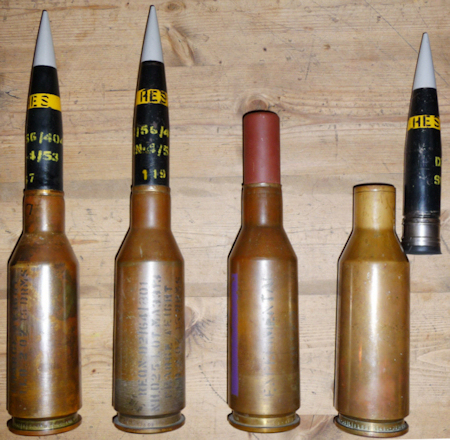 This photo shows the Vigilante cartridge (right) next to the 35x228 Oerlikon round. 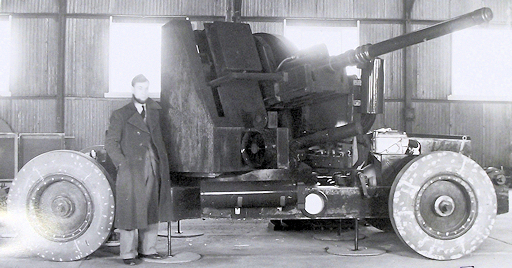 The gun was also different; the biggest of the rotary cannon. In general principle rotary guns are similar to revolvers in that they have multiple chambers to speed up reloading, except that each chamber has its own barrel and the whole lot spin round under external power. The gun was designated T250, had six barrels and was fired at 3,000 rpm (reduced to 120 rpm for engaging ground targets). 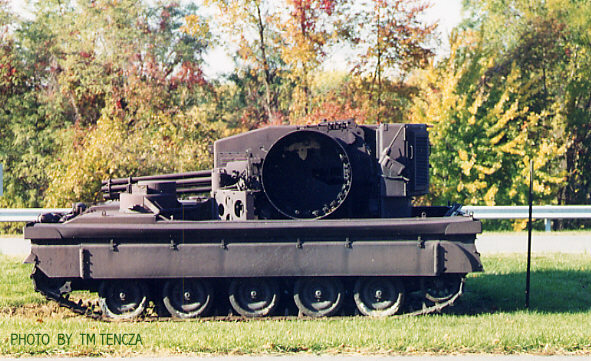 The gun was fitted to a tracked carrier, the T249, based on lengthened version of the chassis of the M113 APC. The gun is shown below, with another view showing its 192-round pan magazine on the left side of the turret. Vigilante had reached the evaluation stage in 1960 but was cancelled shortly thereafter. Its development was overtaken by a precocious new American missile system called Mauler, which was intended to operate automatically once switched on. It was supposed to detect threats, fire a missile and guided it to its target without human intervention, leaving the operators (in Ian Hogg's words) to chalk up the score. Like many ambitious early missile projects, this promised far more than it was able to deliver and was eventually cancelled in 1965, but not before it had terminated the Vigilante. The US Army was left with the M163, a 20mm Vulcan rotary mounted on a M113 tracked vehicle. One last postscript to the Vigilante story: Sperry brought the gun back out for one last try during the US Army's DIVAD competition of the late 1970s. Their unsuccessful entry used the Vigilante rechambered for 35 x 228 Oerlikon, mounted on an M-48 chassis. For a detailed description of the genesis, progress and outcome of the DIVAD competition, see THIS account. Any other information about the Red King, Red Queen or Vigilante will be gratefully received.